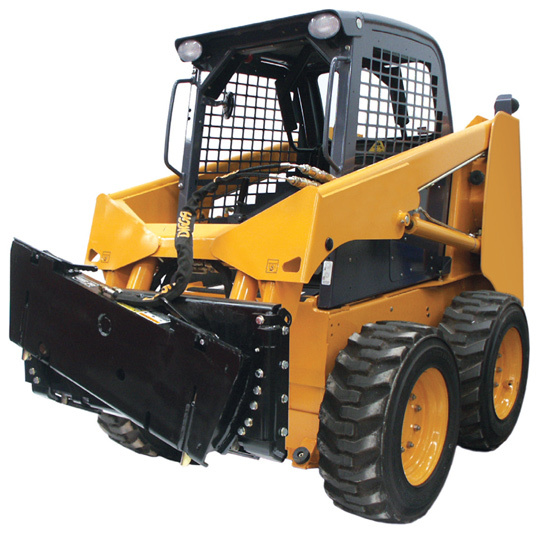 Allows full utilization of skid-steer on hilly terrain. Attaches to a skid-steer universal hitch to allow 18° left or right tilt off centre line. Tilts buckets and landscaping implements for more precise grading, levelling and trenching. Valve package is mounted on Tilt Attach for use with hydraulic powered attachments. Simple connection by electric wiring keeps valves and hoses out of operator’s cabin. Large spiracle ball bushing in centre pivot allows extra strength and durability. Pins attach two halves together instead of bolts.